The first flavor I pick up is a light salt, with touches of garlic. The chewing brings on a bit more salt and garlic, with some natural meat flavors. For being sold as a, "Garlic" variety, it has a light garlic flavor, with lots of minced garlic bits noticeable. Otherwise, the primary taste profile is that of a lightly salted, natural meat flavor. It's a cleaner, meat flavor, almost like that of deli roasted beef, with little else for flavor aside from a wisp of salt and a touch of garlic. The meat consistency seems excellent, lightly marbleized with very little fat. It's dry, with a light crunch, but not tough. It actually breaks apart and chews somewhat easily. It's very much like other jerky brands from New Mexico, highly dry, lightly crunchy, yet still chews down to a steak-like texture. This Garlic beef jerky from Jerky by Art seems very simple, yet manages to create a lot of satisfaction. It mostly comes from the natural meat flavors, the steak-like chewing, and the light crunch. 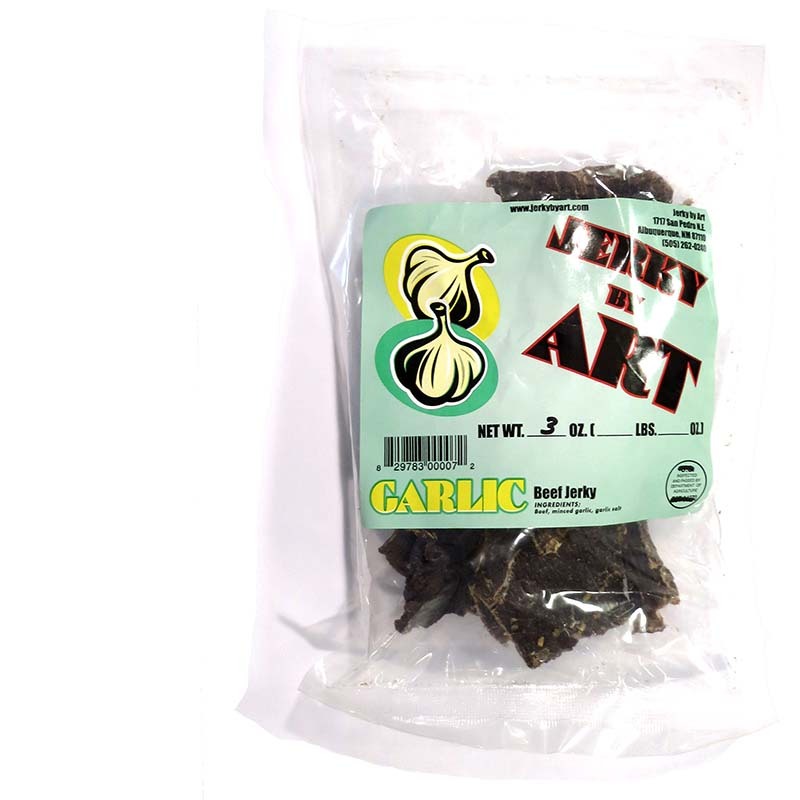 It's low sodium and seasonings seems to give this jerky a cleaner flavor, yet sill generates just enough garlic to break the monotony. Otherwise, expect a light, clean tasting jerky, that's mild enough for all audiences, yet still sophisticated through its simplicity.